My four year old had his first nightmare this week, or at least the first one he remembered and could articulate. It came directly from a children’s book that I had been meaning to toss. One of those books where something seems scary and then they realize everything is fine (it’s only a hedgehog, not a monster), but in the meantime they throw in spooky illustrations. It pays to pre-read all hand-me -down children’s books, but this one wound up in circulation even though I had glanced at it and knew better. So, I googled for a solution and found lots of of great suggestions. We wound up employing a three part solution. 1) First, we talked about it. He told me about the dream slowly throughout the day and it wasn’t until my husband came home that we realized it it came straight from the book. That was actually a relief to me, that he isn’t inventing his own scary things yet. I think it helped to clarify that while dreams seem real and can be scary, they are not actually happening and cannot hurt you physically. That seemed to reassure him a little bit, but not much. 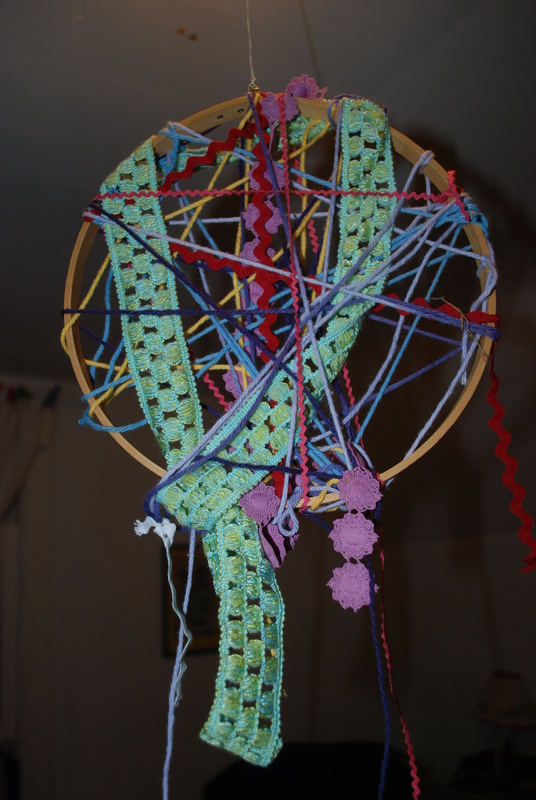 2) Second, we made a home spun dream catcher. We broke into my sewing supplies and quickly whipped up this dream catcher complete with lots of rickrack from a yard sale and a piece of my great grandmother’s thread for luck. We also used an embroidery hoop, because get real, when am I going to take up embroidery? This was a very age appropriate project for my son at four, he was able to do all of the material selection and most of the wrapping and twisting. It turned out to be a pretty fun looking mobile that will hopefully keep bad dreams at bay for a while too. He loves it and it was very much his project. He even made the number 4 for his age a few times, you can see one in red rickrack above. The second part of the solution was quick and easy and maybe even his favorite part. 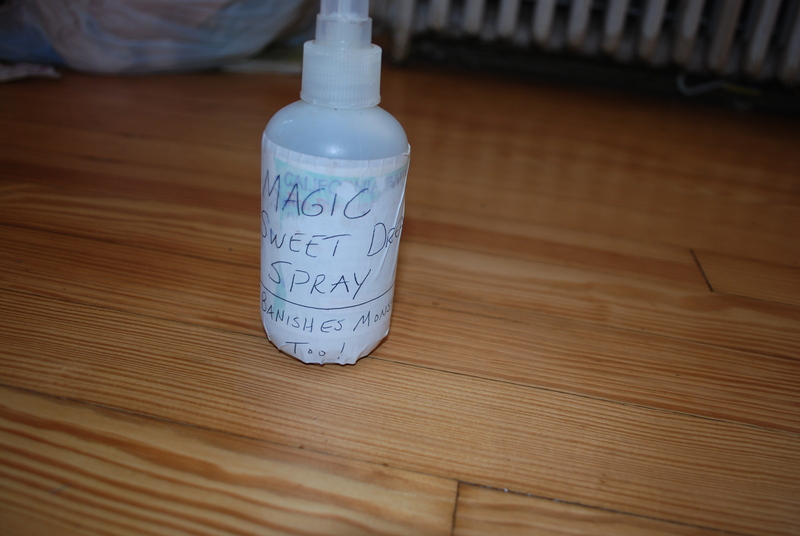 We re-purposed an old spray bottle (California Baby Diaper Spray) into our own Magic Sweet Dream Spray. This was not an original idea, it was part of what my google search turned up. Since he already loves spray bottles, this one was a huge hit. We filled the bottle with water and some vanilla extract and I let him spray away on his bed, his sister’s bed, and even the dream catcher. When he asks me if these solutions will work, I answer that I think they will work but I am careful not to promise. I am sure we will see more bad dreams in the coming years, but so far this one did not return and the sweet dream spray seems to be working in as a regular part of the bedtime routine. Even with a drop of vanilla, the spray smells great and since he is in charge of the spray bottle it is a huge hit. Something tells me we will be refilling it often. As an aside, I think this was a moment where blogging helped me be a better mother. While we would have attempted to do this either way, the thought of writing about it helped ensure we did not get distracted halfway through and inspired the picture taking in hopes that it could be helpful to other parents. Having an audience, even one that is largely imagined, can make us better people and parents. So thanks for reading and being that audience, it helps! bad dreams, blog, blogging, children, google, mothering, nightmares, Parenting and Family, pre-schoolers, sweet dreams, writing. Bookmark. it was nice of your mum to remember and tell you that. It is amazing to hear children start to articulate dreams. They get so annoyed when you were in a dream and don’t remember what happened. thanks for reading! My 4-1/2 also had his first Big Scary Dream lately, and we did the dream-catcher, too, but with stuff from the yard: bird feathers, moss, sticks and such. I am glad that worked. I read about that technique and might need to use it in the future. Great last line. It sounds like our we both have 4 1/2 year olds. Thanks for visiting and reading my blog!